French game site Gameblog.fr reported earlier today that Amazon's French digital storefront leaked details about the next installment in Activision's blockbuster FPS series. 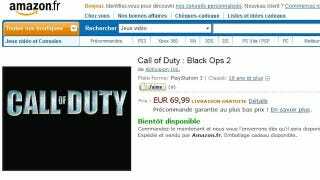 The site claims that a product page for the sequel to the 2010 Call of Duty title went live on Amazon.fr and that, after they reported this, Activision France requested that the story be killed. When they refused, Gameblog.fr claims that the publisher blacklisted them, disinviting them from a Transformers: Fall of Cybertron preview event and pulling planned advertising from the media outlet. Gameblog.fr also claims that other sites that covered the story were coerced into pulling their coverage off the internet after similar threats by Activision. It seems odd that Activision would come down so hard on media outlets for reporting a product listing when the gaffe was on Amazon's part. All of the above should be taken with grains of salt. We've reached out to Amazon France and Activision and will update the story if we hear back. UPDATE: Joystiq's reporting further evidence that Black Ops 2 may be a possibility, finding the Linkedin profile of an artist employed by a studio that's worked on past Activision projects. Including, surprise, Call of Duty: Black Ops.